I picked up my daughter’s end-of-year school report recently. Several neighbours and friends have looked at it, read out parts of it in silly voices, done the customary teasing, and then said, ‘You must be really proud.’ Well, yes, we are proud – of her for attaining ‘distinction’ in Italian when a year ago she didn’t know a word, and a little proud of ourselves too for having had the courage of our convictions in making the move to Italy. As a teacher myself, my prime concern was for Adriana, now eight years old. Before our move to Gualdo, a tiny hilltop village in Le Marche, we lived in Athens, where a decent education, in Greek or English, came at a premium. So for two years Adriana attended an excellent international school following the British curriculum, with facilities that would have been unthinkable when I was a child. Our announcement that we were thinking of relocating to Italy to open a B&B and grow organic food met with concern from our friends and relatives over Adriana’s education. She was already bi-lingual, so surely introducing a third language would be totally confusing. And why deny her the chance of a good start in life by taking her out of such a good school? I knew there was no international school for hundreds of miles, so Italian state school was the only option. Jaws dropped but, trying to quell sneaking feelings of guilt, we began to look at schools near Gualdo. One positive thing here is that parents are not limited by catchment areas, so we first visited an experimental school in the larger town of San Ginesio, with excellent facilities, relatively small classes (about 15 pupils), and a headmistress who was obviously dedicated to the job and the children. Yet we didn’t choose this school, as we met our estate agent in town one day. His wife, Maura, is the maths teacher at our local school in Gualdo. She quickly procured the key and took us on a private tour, answering the questions I fired at her as we went. The school was small, yes, but it was spotlessly clean and there was a large room for PE and a computer room in the middle school upstairs. One thing she said struck me: ‘These children may know a little less than in bigger places but at least they’re OK psychologically’. I knew this was the right school. There were other non-Italian children and, more importantly, all her schoolmates lived in the immediate vicinity, which was vital in helping her to establish friendships. So preparations for 15th September began with the purchase of the ubiquitous grembiule – the overall all schoolchildren wear – and registration, requiring a residence permit, proof of up-to-date inoculations and the last school report. The bus service which takes Adriana to and from school was ridiculously cheap, and I was told the school meal service would begin in October. For this, parents buy a book of tickets which the children exchange for a very grown up, three-course meal, which Adriana assures me is wonderful. Well, what Italian mother would permit anything other than decent food? There was a rather strange system of acquiring textbooks which involved ordering them from the bookshop without paying for them, then presenting a chit to the school to be sent to the town hall so they could reimburse the shopkeeper. The day arrived when Adriana became an ‘Italian’ schoolchild. There were five children in her class, Year Two and six in Year Three – not a bad teacher/pupil ratio! They share a classroom but do separate work. Even at primary level, subjects are taught by different teachers, although this will change with the new Education Act. The curriculum comprises Italian, Maths, Science, Geography, History, Social Studies, English, RE (at the parents’ discretion), PE, Art and Music, although I feel more attention could be paid to the last three. The proposed computer lessons never materialised, but this should be rectified next term. However, most incredibly Adriana was given free private Italian lessons in school time by the Italian teacher, Silvia, a lovely softly spoken lady to whom I shall be forever grateful. These lessons form part of the Italian government’s initiative to integrate non-Italian children as quickly as possible, and judging by Adriana’s progress, it is very successful. Adriana did integrate very quickly, mostly because the teachers did everything possible to help her and her schoolmates were so kind, using their meagre English to approach her and offer friendship. There were times when my Englishness showed through. I bought the wrong kind of exercise books, not realising that there is different line spacing for each class – I was more concerned that the front cover had no grotesque cartoon character on it; Adriana was the only child to turn up when Gualdo was covered with snow; I still can’t fathom why the children don’t play outside at break time; and the hilarious account in Tim Parks’ An Italian Education of how parent committee members are ‘democratically’ elected is all true. But none of that really matters. 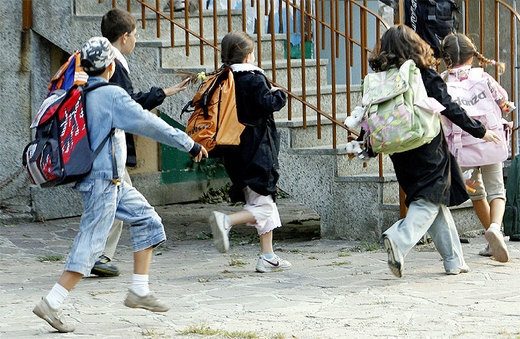 Gualdo, a tiny village in the middle of nowhere, has a thriving elementary school of only 27 children, who are not brats and have a strong sense of identity. Indeed if you look down the register, you can identify most of the children through other places in the village. There’s Samantha whose family runs the bar and provides a bus service so older children can go to high school further away, Lorenzo whose parents have the grocery shop, Adriana’s friend Elena whose parents work at the petrol station. In the summer holidays all the children gather in the park for a couple of hours before dinner. When I drop Adriana off, several children aged from three to13 will look up and call, ‘Ciao, Adriana’ and I feel she too has found her place. There are some things that school fees just can’t buy.